Google Dance is the period when Google re changes or updates its indexing algorithms , and results fluctuate widely for a period of a week atleast. Duting this time your rankings on google may vary to your old rankings but it mat comes back after some fixed time. How frequently Google Dance Happen? The name "Google Dance" was in the past used to describe the period that a major index update of the Google search engine are being implemented. These major Google index update occured on average every month or then 10 times per year. It was easiest to identified by significant changes in Google organic search results, and by an updation of Google's cache of all indexed pages. But the update did not proceed as a switch from one index to another like the flip of a switch. In fact, it took several days like 3 to 4 days to finish the complete update of the index. Because Google, like every other search engine, depends on their customers knowing that they deliver authoritative reliable results 24 hours of the day, seven days a week, updates pose a serious issue. Google can not shut down for maintenance and they cannot afford to go offline for even one while. Hence, we had the Dance. Every search engine goes through it, some more or less often than Google. However, it is only because of Google's reach that we pay attention to its rebuild more than that of any other engine. 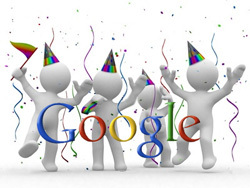 The name "Google Dance" is often used to describe the index update of the Google search engine. Google's index update occurs on average once per month. It can be identified by significant movement in search results and especially by Google's cache of all indexed pages reflecting the status of Google's last spidering. But the update does not proceed as a switch from one index to another at one point in time. In fact, it takes several days to complete the index update. During this period, the old and the new index alternate on www.google.com. At an early stage, the results from the new index occur sporadically. But later on, they appear more frequently. Google dances. The "Google Dance" would happen anywhere up to 36 times per year, however in 2003 Google begun updating its index on a weekly basis, which all but eliminated the Google Dance. One of my websites that sat at the number one spot for it's keyword for the better part of this year starting around January up until last week fell to page 6. Cannot figure out what happened but I'm confused and not sure what to do to bring it back. Have I done something wrong? Is there someplace I can go to test to figure it out just a little upset. Any advice? I know it's on page 6 two of my links back to back but there are newer sites one also of mine similar keyword coming up in the 4th spot but the other has just fallen to page 6. Is this considered a Google Dance or something else? This happened once in December of 2010 but it was completely off of Google. I assume that was the google sandbox but this seems to me after doing loads of research online a Google Dance? Any help would be appreciated. Thanks.